Gorgeous remodel in the heart of Arrowhead Ranch with high end upgrades, great community features and beautiful mountain views! This spacious home feels bright and open with soaring ceilings, also includes new wood-like tile floors, newer A/C, an extra downstairs guest bedroom with full bath, and a 3-car garage with built-in storage cabinets. The gourmet kitchen has newer custom espresso cabinetry, quartz countertops, a large working island, stainless steel appliances, built-in desk and walk-in pantry! The master retreat also features vaulted ceilings, new carpet, a private balcony with mountain views, and a master en suite! This spa-like master bathroom has dual vanities with modern vessel sinks, a large soaking tub, new backsplash, cabinetry and flooring and a large walk-in shower. Directions: From 59th Ave, head West on Deer Valley Rd. Turn right (north) on 59th Ln, turn right (east) on Louise Dr, road curves and becomes 59th Dr. Home on right side of street. Full roof update in 2008. Approximate size: 7983.00 sq. ft. Please, send me more information on this property: MLS# 5869447 – $400,000 – 22009 N 59th Drive, Glendale, AZ 85310. 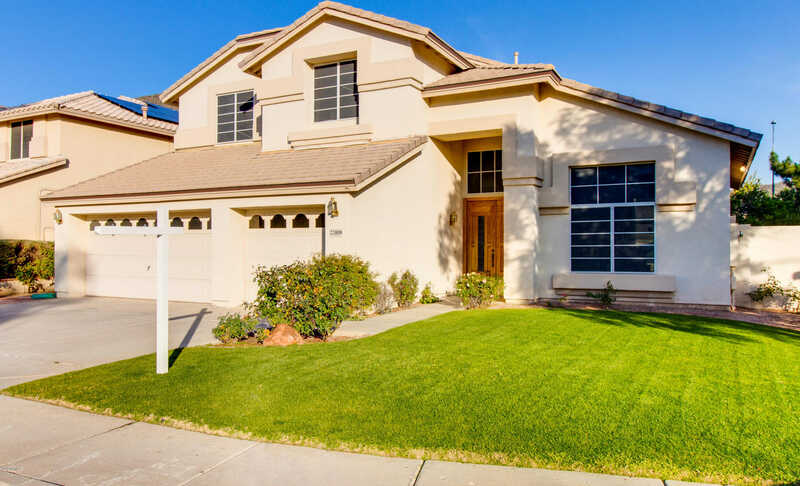 I would like to schedule a showing appointment for this property: MLS# 5869447 – $400,000 – 22009 N 59th Drive, Glendale, AZ 85310.